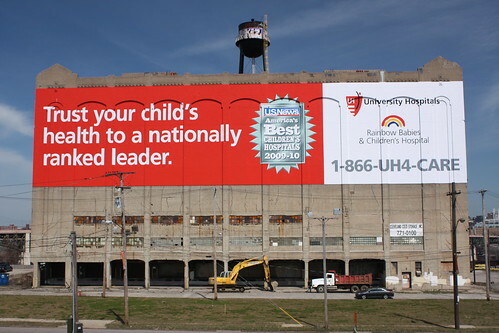 If you drive on Interstate 90 through downtown Cleveland, you've surely seen the Cold Storage Warehouse, most notable at this point in time as the large flat surface used as a support for billboards. 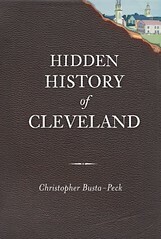 The building is located just south of the Cuyahoga River. Built in 1927-1928, the Distribution Terminal Warehouse represented a major change in the way food was handled and distributed in greater Cleveland. This insulated cold-storage structure will be demolished to make way for the new I-90 bridge. I've wanted to write something about the structure. I recently learned that the Ohio Historical Society had published a document detailing the historic significance of this building. I wrote to the author, Nancy Campbell, who was kind enough to mail me a copy. I present here the PDF (warning: 17 MB! ), Historic Context for Cleveland’s Distribution Terminal Warehouse: The Significance of a Cold Storage Building. In this document Ms. Campbell provides historical context for the Cold Storage Building, explaining why it was needed and how it fit into the food service industry in this area. She further describes grocery shopping in northeast Ohio at the time. In addition to a description of this building, she also describes other extant cold storage structures in Cleveland. Finally, she concludes with a reprint of a 1932 article about the terminal by Wilbur J. Watson, and compares the photos used in the article with recent photos of the same structures. This structure is likely past the state of preservation. The building appears to many a simple concrete box with few aesthetic merits. The historical significance of it is not in the exterior details, but in the landmark it represents in our commercial history. Nancy Campbell's 48 page analysis is worth a read, or, at the very least, a skim. We need to understand just what it is that we are losing. I bet she'll put up a fight coming down. I have always loved the Cold Storage Building and look forward to reading Ms. Campbell's document. I'm thinking the building was also the home for some rather controversial billboards at one time. I will miss it nonetheless. I worked in the Distribution Terminal Warehouse from 1967-1975 as my first job. I went to St. John Cantius High School and walked to work daily from there. I worked for the company - Commissary Foods, Inc. We provided various menu items for the Manner's Big Boy Restaurants. We made the burgers on site from huge sides of beef stored in freezers in the warehouse. A lot of things changed over the years, but I still have a lot of good memories of the other companies (Northern Foods, Willard Sugar, etc) and the people who worked there, too. It will be sad to see the building go. Can't wait to have a clear view of downtown!